About SNC-Lavalin, let us first stipulate that this is not about a particular lack of ethics or character in Justin Trudeau. It’s more general than that. Had Paul Martin, or Jean Chretien, or Brian Mulroney been in power, they would have likely done exactly what he did. I don’t mean breaking the law by instructing the attorney general to cut a deal with SNC-Lavalin. I mean writing the law that the made a deal with SNC-Lavalin possible in the first place. They spent their entire adult lives marinating in the back-scratching, insider-dealing, influence-trading world of Quebec’s political-industrial complex, learning how to grease the pole the advancement and the palms of those who could do the advancing. That’s how they spent their young adult years, even as Justin spent his as a snowboard instructor. Certainly the weight of Quebec’s editorial opinion and media consensus regarding SNC-Lavalin is that Ottawa does not understand how things are done in Quebec. If a major employer is in danger, solidarity requires that it be given all possible aid – direct subsidies, preferential contracts and, if necessary, an opportune change in the law to dispense with nettlesome criminal charges. That is the real SNC-Lavalin scandal. Not that a prime minister’s henchmen henchpeople may have illegally sought to influence the attorney general, but that the law was changed to benefit SNC-Lavalin itself. The scandal, as is often remarked, is not what is illegal, but what is legal. A little history. SNC-Lavalin is part of the Building of the Modern Quebec™, Canada’s largest engineering firm with thousands of Quebec employees and projects all over the world. In 2006, Stephen Harper – our only prime minister of consequence since 1968 who did not emerge from the Quebec political-industrial complex – passed his post-sponsorship scandal reform measures, which included a ten-year prohibition on federal government contracts for firms convicted of corruption. SNC-Lavalin is the kind of gargantuan firm that has teams of lawyers who would have advised senior management that bribing officials in say, Libya, could now have serious consequences at home, with access denied to the public trough. SNC-Lavalin went ahead with its bribery program in Libya anyway on the grounds that everyone does it and calculating that any adverse consequences back home could be, well, taken care of. It’s possible that those in the prime minister’s office, perhaps even the prime minister himself, were so shocked that all their efforts were for naught that they told Jody Wilson-Raybould to hop to it, and get the prosecutors onside. And so it went. IN 2013, SNC-Lavalin agreed to be disqualified from bidding on World Bank contracts for 10 years as a consequence of its corrupt practices in Bangladesh and Cambodia. In 2015, the RCMP brought bribery charges against SNC-Lavalin for allegedly paying nearly $48 million to public officials in Libya between 2001 and 2011 to influence government decisions. If convicted that would mean no federal contracts for SNC-Lavalin for 10 years. But this was Canada, not the World Bank. It could be fixed. Why? Because it’s 2015, and the mean Calgary prime minister who did not understand the Quebec political-industrial complex was gone. Sunny days indeed for SNC-Lavalin. And so a ferocious lobbying campaign was launched with dozens and dozens of meetings between SNC-Lavalin and government officials. 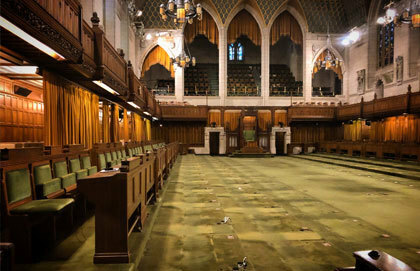 SNC-Lavalin spared no expense, bringing both the former Clerk of the Privy Council – Canada’s head of the civil service and deputy minister to the prime minister – and a former Supreme Court judge on to advise it. And in February 2018, it paid off. The Trudeau government said that it would change the law to allow for “deferred prosecution agreements” for companies like SNC-Lavalin – actually, specifically for SNC-Lavalin – to avoid criminal convictions by paying a fine and promising to be very, very good in the future. This was buried in the omnibus budget implementation bill passed last spring. Paul Wells describes it all magnificently in Maclean’s here. Despite the best efforts of the Liberals to hide the whole deal, it did get some modest attention from the House of Commons finance committee, which wondered what a criminal matter was doing in the weeds of the budget bill. It looked an awful like a special favour for well-connected friends. Was it that? Certainly not, the committee was told. Meanwhile, SNC-Lavalin was found to have made illegal political donations from 2004 to 2011. The illegal donations were made on a bipartisan basis at the federal level: The Grits got $109,615, while the Tories got $8,187. The anger in Quebec opinion is therefore understandable. After all the herculean effort of SNC-Lavalin – illegal donations, sinecures for retired federal officials, untold hours spend in lobbying, the sheer stubborn determination of having favours-for-friends rammed through in the omnibus budget bill – could it be possible that the federal justice department would decline to use the get-of-jail-for-a-fine card that SNC-Lavalin had sweated, and paid, and lobbied, and begged, and threatened, and debased our political coin to get? 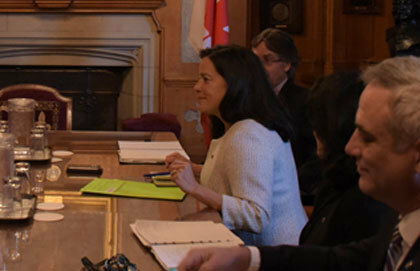 It’s possible that those in the prime minister’s office, perhaps even the prime minister himself, were so shocked that all their efforts were for naught that they told Jody Wilson-Raybould to hop to it, and get the prosecutors onside. It’s possible that she told them no. It’s possible that they then thought that of course she wouldn’t get it, being an independent-minded Indigenous woman from Vancouver, and it would be altogether easier to dump her from justice and install a new attorney general from, well, it could be anywhere, but perhaps Montreal. Which is what they did. Or are alleged to have done by the story in the Globe and Mail, the credibility of which Peter Stockland evaluated here on Monday. Whether the Globe story is true is massively important, but secondary. The greater offense is that the Globe story could be true. The scandal is not that the PMO wanted the justice department to use the rules rigged to the advantage of SNC-Lavalin. It’s that the rules could be rigged, and were. Jody Wilson-Raybould may have thought that she was following the law. She did not know that she was supposed to follow the rules of the game.